The Staffordshire Bull Terrier is a breed of dog that has received more than its fair share of nicknames over the years. It has been called everything from devil dog to pit bull to a nursery dog and just about everything in between. 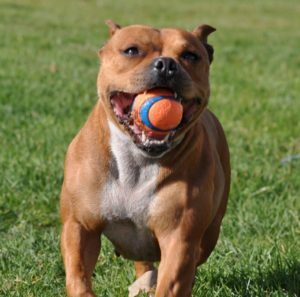 Some people have claimed that Staffy Bulls, as they are sometimes called, were some of the friendliest dogs they have ever know, while other people have called them the most ferocious and dangerous breed of dog ever to walk on all fours. While neither of these extremes are sure to be the whole truth, I’m willing to bet that if we look somewhere in the middle then we’ll discover the true nature of this dog breed. Ultimately, the only way to find out about this dog is to look at the science and the history of this breed. And, oh what a history it is. This dog has been bred for over 200-years to be the dog that we enjoy today. It has been a faithful friend to hunters, farmers, and families who looked to it for their protection. So, shouldn’t we take a few moments and learn more about it before we make any rash decisions about these marvelous animals? I know that I wanted to – which is why I decided to do all the below research. I hope that you enjoy it and that it serves you well. Staffordshire Bull Terrier are dogs that can trace their heritage back to the bulldogs of the eighteenth and nineteenth centuries. Bulldogs had received their name because they were used for the common practice of Bull Baiting in England, Scotland, and Ireland. During this activity, packs of bulldogs would be set to attack a chained-up bull. The bull would defend itself by placing its horns close to the ground and attempting to launch the dogs into the air when they got close. The dogs, in turn, attempted to attack the bull by getting down low to the ground and making a run at its legs or other exposed parts. Some of you might be wondering what the purpose of Bull Baiting was. After all, it sounds like a nonsensical practice. However, whether you agree with it or not, there was a reason it was done. It was done by butchers to tenderize the beef before they sold it. In fact, in many parts of Europe, it was illegal to sell bull meat unless it had been Bull Baited. Of course, this wasn’t the only reason it was done. Eventually, it evolved into a blood sport where people would bet on whether a particular dog would be killed by a bull or whether the bull would be taken down by the dogs. Fortunately, this practice would eventually become illegal in 1802. That is when the real evolution of this particular dog breed began to take place. With the practice of Bull Baiting becoming illegal, “pure” bulldogs were bred with a variety of other types of dogs. Some dogs were mixed with the intent purpose of making them fighting dogs known as Pit Bulls. Thanks in part to the rising popularity of dog fighting “pits” that had taken the place of Bull Baiting. In the case of the Staffordshire Bull Terrier, bulldogs were mixed with Black & Tan Terriers and perhaps Fox Terriers. Staffy Bulls were eventually brought to the United States as immigrants brought their fighting dogs to help with hunting, driving cattle and protecting them from predators. Some of these American immigrants kept their dogs pure, while others continued the practice of selective breeding and eventually created the breed known as the American Pit Bull Terrier (APBT). 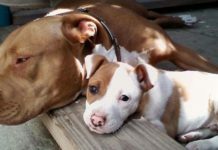 For a long time, the Staffordshire Bull Terrier and the American Pit Bull Terrier were considered to be one and the same dog breed. However, it eventually became clear that there were major differences between the two breeds. Fortunately, the United Kennel Club (UKC) came to the decision that it was a separate breed from the APBT and made it official in 1975. The Staffordshire Bull Terrier is a small dog that usually weighs 40-pounds or less and is about 14 to 16-inches tall – as measured from the ground to the top of its shoulders. It tends to have a head that is deep, short and broad. It has a short muzzle and nice tight lips underneath which are concealed white teeth that bite in a scissor-like pattern. These dogs naturally have rose ears, a type of ear which rises up and flops forward, but it’s a common practice for people to crop the ears of their dogs so you don’t see as many with rose ears as you used to see. These dogs also have a close-coupled body that has a very deep rib framework. They also have very muscled hind-quarters and fore-quarters that are set back a bit. The naturally have low-set tails that have a medium-length to them but a lot of people tend to dock them so you may not see as many of them at full-size as you once would. 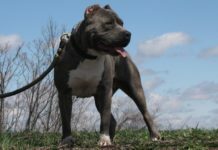 Staffy Bulls has a smooth and short coat that can come in an assortment of colors. The UKC recognizes a wide-assortment of coloration for these dogs which range from red, black, white, fawn and blue. They also recognize many variations of brindle, as well. The colors they don’t recognize for their official breed definition, however, is liver, black and tan. They consider those a fault, although many dogs of this breed have that sort of coloring. Staffy Bulls might just be the dog whose bark is worse than his/her bite. After all, while they generally have a stocky appearance and a forward-facing stance that makes them look like they are always itching to get into a fight, in most cases, you’ll find out that these dogs are quite friendly and lovable – at least towards humans. 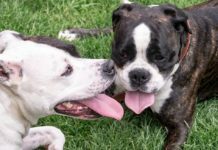 In some cases, they can be quite aggressive with other dogs, so it’s always a good idea to make sure they are well socialized and that you introduce them to new dogs slowly. These dogs also do quite well with children, which is probably why they’ve been called nanny dogs or nursery dogs all throughout history. Although like I’ve said before, and it bears repeating here, it’s import not to leave ANY dog unattended with infants or young children and this dog is no exception. However, these dogs do very well with older children who don’t mistreat them and are familiar. 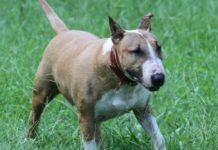 One thing that needs to be mentioned about this breed, however, is that it’s an energetic dog that needs plenty of exercise. It also excels in households where the families spend time with them. If they are left alone for long periods or left outside all of the time, then negative and aggressive behaviors may begin to manifest. This includes chewing up furniture and clothing, getting “snappy” or growling at people. So, it’s always best to spend good quality time with this dog and make sure that it gets plenty of exercise. Another thing that you may need to do for this particular dog breed is to leave chew toys and dog bones around the house. That’s because this dog is a natural chewer and needs to spend some of that chewing energy on a regular basis. So, if you want to ensure that your pet doesn’t chew up other parts of your house, your best bet is to give it plenty of things to chew on. As I’ve said before with other breeds of dogs, each dog breed has its own ailments that it needs to worry about. Which just means there are some health issues you really need to look out for. However, it doesn’t mean that it won’t get another disease that isn’t on the list. 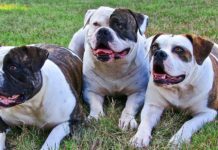 After all, all breeds of dogs may succumb to any number of different health problems – it’s just some breeds are more susceptible to certain illnesses or conditions than other breeds. Two of the health problems usually associated with this breed are Patellar Luxation and Juvenile Cataracts. Patellar Luxation is a disorder in which the dog’s kneecap dislocates from its usual position. This can cause pain, loss of mobility and arthritis in the dog. While there isn’t a known preventative to keep this condition from happening, it can be treated surgically by your veterinarian. Juvenile Cataracts can sometimes develop in this particular dog breed – between the ages of 6-months and 6-years. It can be caused in the dog by a number of different things but is usually caused by diabetes, injury or by retinal atrophy. It’s important to get this condition treated quickly because it can lead to permanent damage to the dog’s eyes. As is the case with most pit bulls or dogs that people think are pit bulls, it’s important to do your research before you get one of these dogs. While it’s not banned under the Dangerous Dogs Act in the U.K, they may be mistaken for breeds that are banned. And it can be even more confusing in the U.S. 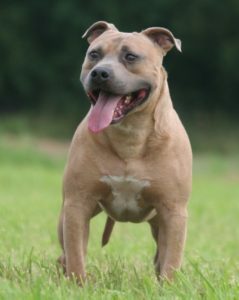 In some areas, this breed of dog may be banned outright, while in other areas it might not be banned outright but may be mistaken for a pit bull – which would be banned in those areas. And private insurance companies make the whole situation even more confusing by adding their own rules to the conversation. Some insurance providers will drop homeowners who own one of these animals or any dog they believe to be a pit bull. The only real way to determine if Staffy Bulls are legal in your area is to do your research and make it through. Make sure that it’s not only legal according to your community standards but also that your homeowner’s insurance policy won’t punish you for owning one of the animals. 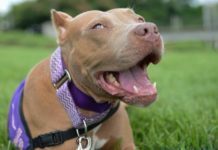 After all, until unfair pit bull laws are done away with, then we all have to be extra vigilant as far as our rights and responsibilities as dog owners are concerned. Over the past few years, the popularity of the Staffordshire Bull Terrier has been on the rise and it’s pretty easy to see why. These small, squat dogs are not only loyal and family friendly but they are a lot of fun to be around. Sure, they may be a little more dog aggressive than other breeds but in the end, these dogs just want to hang out with their families and be part of the pack. Which is something that all of us wants. While there are still people who don’t understand this dog breed or want to simply write them off as dangerous dogs, I think that many people are beginning to come to the realization that those things simply aren’t true. These dogs are not any more or less aggressive than any other dog. Each and every dog should be evaluated as an individual and not judged by its breed. If you do that, you’ll soon realize that while there are some bad dogs, the vast majority of them are good dogs.